This romantic real wedding is truly an international romance – the bride and groom both hail from Northern Ireland but met and tied the knot in Dubai with a Tuscan inspired wedding! Gemma and Ryan were half a world away from home when they happened upon each other thanks to a chance encounter out with friends and the result was their elegant beach wedding with modern glam style. Maria Sundin Photography and My Lovely Wedding helped them realize their vision for a romantic rustic wedding hosted at Madinat Jumeirah. 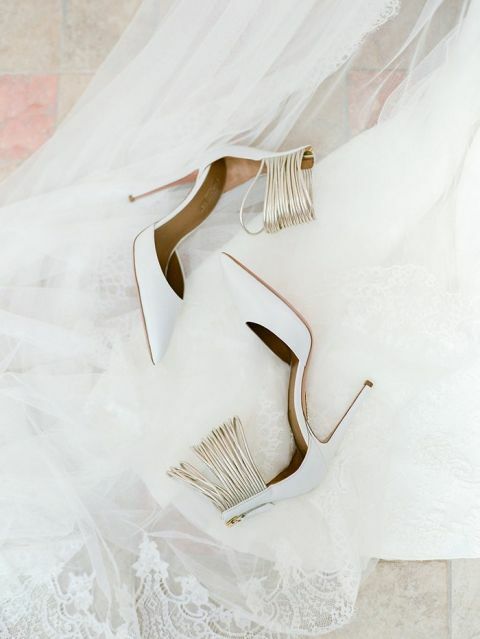 Gemma’s top priority when it came to realizing their ideal wedding day was absolutely her dress! 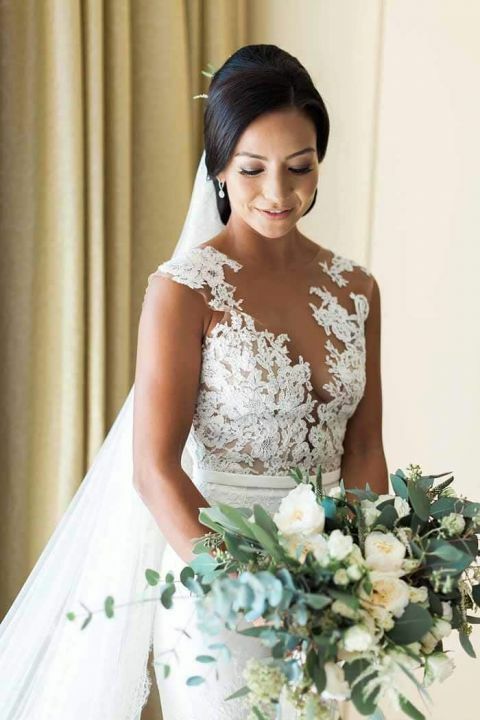 She knew the Vicenta gown from Pronovias was the one as soon as she saw it, and was able to say yes to her dress at La Boda Bridal in Northern Ireland on a trip home! She fell in love with the fitted crepe gown with a dramatic illusion neckline and appliqué lace, which beautifully suited the organic elegance of their wedding at the Madinat Jumeirah. 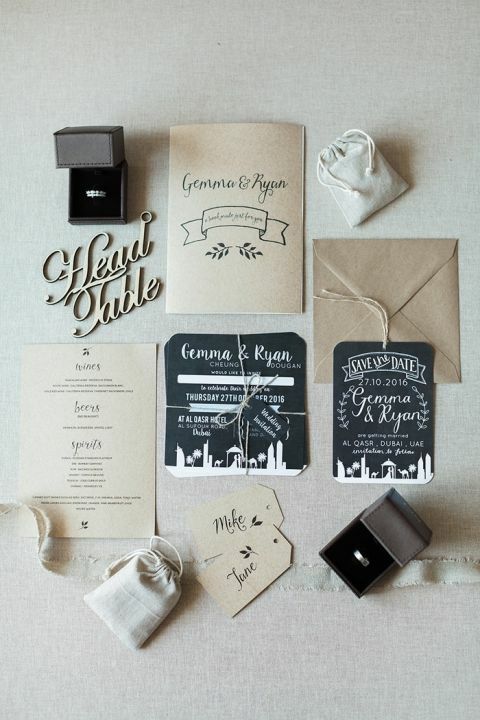 Natural elements gave their wedding the organic Tuscan feel that My Lovely Wedding helped them realize. Potted olive trees added a splash of silvery green to the aisle leading to their ceremony against the turquoise coast. 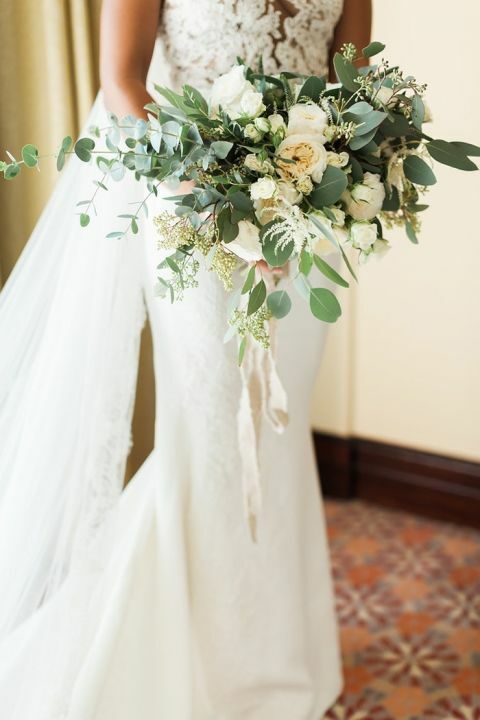 Vintage Bloom created the organic ceremony arch as well as the bride’s bouquet of eucalyptus and white flowers. Her bridesmaids stunned in draped dusty blue dresses with hand tied bouquets of white roses, which softened the groomsmen in their sharp navy suits. The bridal party’s shades of blue added a pop of bright color to the palette of elegant neutrals and natural greenery. After the blessing ceremony on the beach, guests made their way by Arabic Dhow boat along the canals of the Madinat Jumeirah to the Magnolia courtyard, where palm trees hung with twinkle lights lit the pastoral reception tables. Rustic centerpieces of potted plants and oranges added a country touch to the elegant farm table set under an arch of greenery and white flowers. Laser cut signage added a modern touch to the couple’s chairs and directed guests to cocktails and dancing. A colorful wedding cake adorned with sugar flowers capped off the night with a festive touch! Stunning wedding! The gown is just perfection! Gorgeous couple with beautiful wedding guests.